From Belper along the Derwent Valley to Matlock. 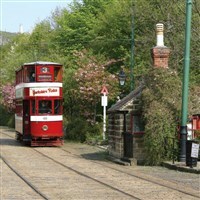 Later, we move on to Crich for an included visit to the Tramway Village. 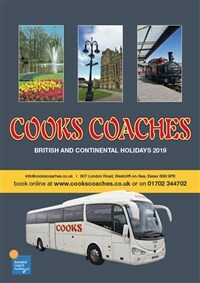 Unlimited rides on trams running up and down cobbled streets, plus period shops, a museum, workshop and pub. Morning drive to Chatsworth House for a visit to see the magnificent collection of paintings, sculpture, silver, porcelain and other treasures. Plus a 100 acre garden surrounded by a 1,000 acre park landscaped by ‘Capability’ Brown. Nearby Bakewell is a picturesque town where we have another stop. After breakfast we leave for home. & coffee making facilities. The hotel has a lift.